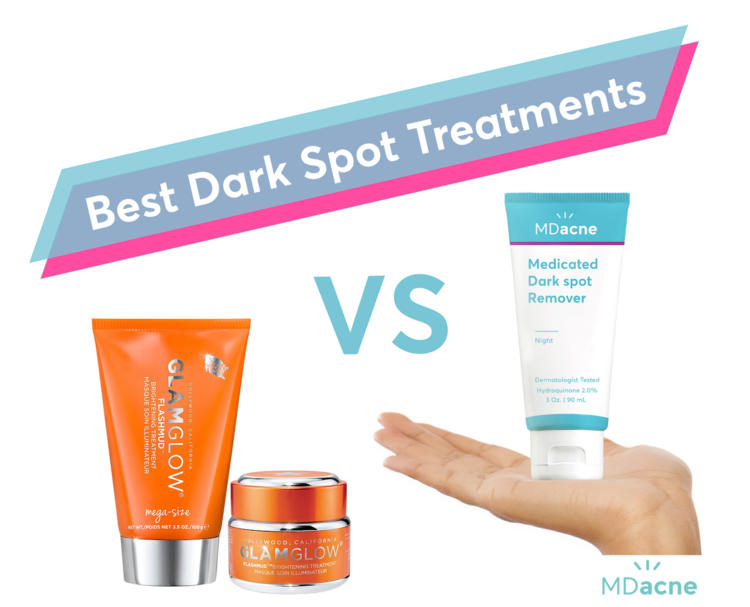 What is the Best Product to Fade Dark Spots? GlamGlow's Flashmud and MDacne's Dark Spot Remover are 2 products designed to help fade post-acne dark spots (i.e. hyperpigmentation). Both products are sold for $59.95 but have formulas, uses, and benefits. Glamglow’s Flashmud is a clay-based face mask with a brightening including two beta hydroxy acids or "BHAs" (Salicylic Acid and Lactic Acid) as well as Vitamin C. MDacne’s Dark spot remover is medical-grade dark spot corrector that uses Hydroquinone 2% combined with both a BHA (Salicylic Acid) and AHA (Glycolic Acid) and plant-based compounds that can help fade dark spots (bearberry), reduce redness (aloe vera), calm inflammation, and renew the skin faster (Retinoids). Let's take a closer look at how they compare! How do the Ingredients in GlamGlow's Flashmud and MDacne's Dark Spot Remover Compare? GlamGlow’s Flashmud concentrates on one type of active ingredient, BHA's, which induces a mild exfoliation, helps remove some melanin from the upper layers of the skin, and leave behind a natural glow. The foundation of the product (white clay) has an additional calming effect but does not have a direct impact on improving hyperpigmentation. The MDacne Dark Spot Remover is inspired by the Kligman Formula, the skin lightening formula used by most dermatologists. Instead of adding hydrocortisone (found in the original Kligman Formula), MDacne combines the main active ingredient and Hydroquinone 2%, the "gold standard for dermatologists’ treatment of dark spots" (Francesca Fusco, MD) with plant-based skin lightening agent, bearberry extract. It also replaces retinoic acid with safer retinoids and includes BHA and AHA complexes that enhance penetration of the hydroquinone, improving efficacy while reducing irritation. What is the difference in application between the GlamGlow’s Flashmud and MDacne’s Dark spot remover? The second significant difference between the GlamGlow Flashmud mask and MDacne Dark Spot Removers is the amount of time that they stay in contact with the skin. Anti-pigmentation compounds require time to work. By exfoliating the skin, the GlamGlow Flashmud mask enables the active ingredients to better penetrate the skin while applying. However to prevent over-irritation, it only suitable to be used 1-2x/week. The MDacne Dark Spot Remover comes in the form of a cream and is intended to be applied to the skin and left on overnight—every night or every other night. Therefore, it allows a much longer period of time for the active ingredients to work into this skin, resulting in better long-term efficacy. Both The GlamGlow Flashmud and MDacne Dark Spot Remover are paraben-free and phthalate-free. The MDacne’s Dark Spot remover is also dermatologist-tested tested and cruelty-free. Both the GlamGlow Flashmud and MDacne Dark Spot Remover have ingredients that are proven to help fade dark spots, even complexion, and add a natural glow to the skin. 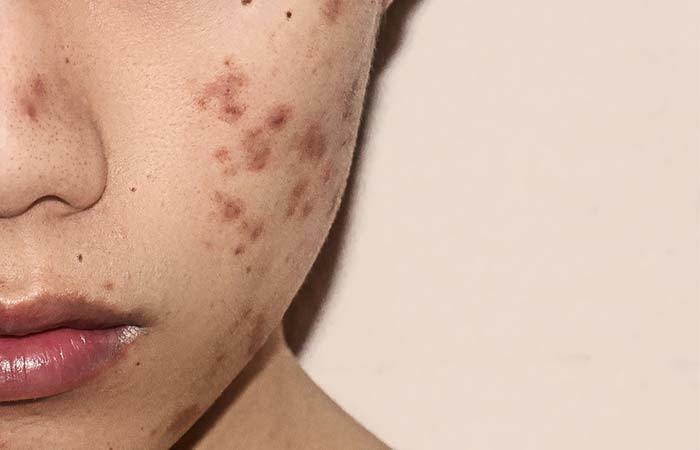 Looking at how they work, are applied, and a list of ingredients it seems that the MDacne Dark spot remover would have a better long-term effect in treating hyperpigmentation. That being said, the GlamGlow Flashmud could be a beneficial "boost" to your skincare regimen, used to refresh and calm the skin. We recommend trying once every 2 weeks and then working up to a weekly application.